Congratulations to Dr. Jun Liu on being chosen as the Pacific Northwest National Laboratory Inventor of the Year. He was named on 4 U.S. patents granted in fiscal years 2011 and 2012. During this same time, he applied for 25 U.S. patents and filed 17 invention reports. 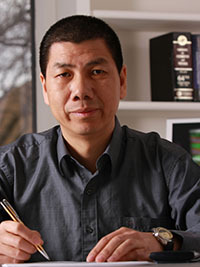 Liu's research often focuses on advanced nanomaterials and catalysis synthesis and characterization for energy and environmental applications. His recent work includes developing graphene and metal oxide nanocomposites for advanced lithium battery applications and work on a multimodal electrochemical probe for transmission electron microscopy. As a scientist and a leader in the materials community, he has received 43 patents and written or co-written more than 300 peer-reviewed articles. The articles have garnered more than 14,000 citations.